This is my very favourite bhajan and infact it is the ringtone of my cell phone too,- so obviously more than anything else - this is the only bhajan which I keep hearing all day long...By the way, now that I think of it- all those readers who have been following my mails since the past few years- definetly know a lot about me by now even though they have never seen or met me..Alllaah Maalik!! Sri Krishna Janmashtami celebrates the birthday of Lord Krishna and is observed on the eighth day of the Shukla Paksha of Bhadrapad month as per traditional calendar followed in North India. The corresponding months in other region is the Shravan month. In 2012, the date of Janmashtami in North India is August 10 and in other parts it is on August 9. 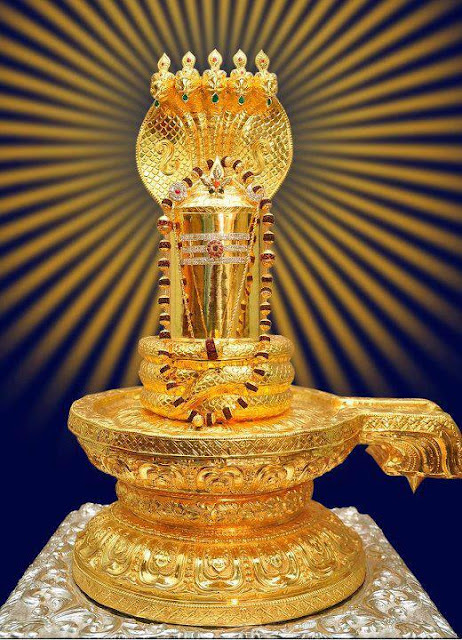 In Tamil Nadu, it is observed on September 8, 2012. In Kerala, Sri Krishna Janmashtami is on September 8, 2012. North India, Gujarat (Dwaraka Temple), Vaishnava tradition in all regions - Sri Krishna Janmashtami is on August 10. 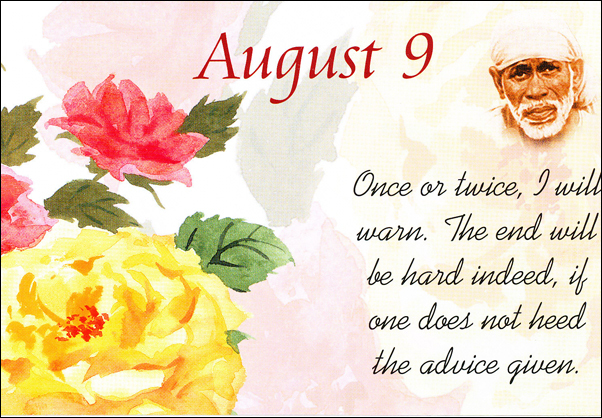 (vrat or fasting in North India is on August 10). Dahi Handi and Gopalakala in Maharashtra is on August 10. The significance of Sri Krishna is that he used his life to explain to us the great teachings in Upanishads. 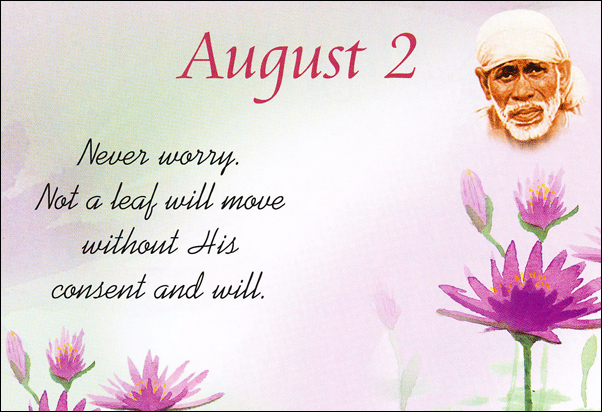 In true sense, he is the Upanishad man. He lived in the moment. He was not an escapist from life. He accepted life in its entirety. He made life a celebration. He was the ever smiling god and that smile continues to conquer millions of hearts. Throughout, his life there was music and just before getting killed by the hunter’s bow he was playing the flute. Music and that immortal smile were present in his death.For many god is a commander, one who grants boons, one who automatically solves problems in life but Sri Krishna will never automatically solve your problems. 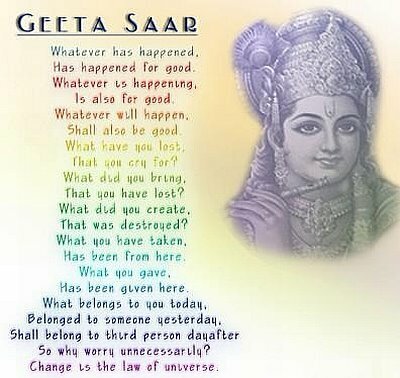 This he demonstrated in the Kurukshetra while delivering the Bhagavad Gita. Krishna never took up arms but instead gave the right direction to Arjuna. In Kurukshetra, Sri Krishna was trying to make us understand the foolishness in expecting someone above (god) to deliver the goods. We have to perform the actions and each action will have a fruit.Sri Krishna is full of life. He showed us the way to live in the modern society. 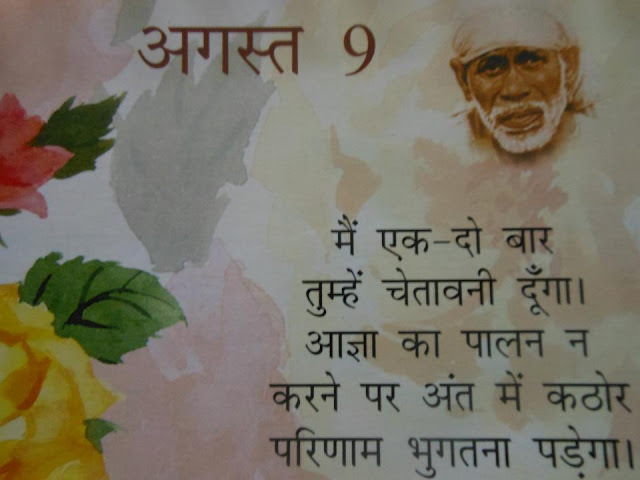 He showed us the concept of Brahman – that life is a continuity. He taught us to remain detached and neutral. Live in the moment and life will be a celebration. Wishing you and your loved ones a very Happy and Blessed Janmashtami.. The shringar Priya Vishnuji is at work. Short hairs, Bajubandh, necklace with other pcs of jewellery, new dress. Our groom is getting ready. Outside the Shringar room, Saptarishis & Devas are wondering how much more time for Shivji’s Shringar to get over as the auspicious muhurt has already started. Vishnuji comes out opening the door, Nandi asks him is the dressing up over? Vishnuji says Shivji is ready for the marriage. Ganga is thinking will this new roop be liked by mother or not. And walks in with style, the most handsome groom with the rishis. Himavan, Mena, Sati’s sisters, Nani everyone is pleasantly surprised by this new look. Everyone is speechless. Shivji is smiling, all the Devatas, Vishnuji , Brhmaji Lakshmiji, saraswatiji, Anasuya looks extremely pleased. In a telepathic convo between Mena- Shivji. Mena: No one must have imagined such a roop of yours. Shivji : Have you accepted me as your Jamata? Mena: All the doubts of my mind are washed away seeing you in this roop. Please forgive me for my mistake. Shivji : You only wished for your daughter’s wellbeing. Mata, you are not at fault. Mena happily comes foreword, puts tilak, does aarati , tells Ganga to get Paravti. Paravti comes with Jaymala in her hand. Shivji is just looking at Parvati only & everyone else is admiring them. Shivji: Just give me a look, my changed roop is incompelete unless you see it. Parvati: I want to see you too but, I am hesitant can’t lift my eyes up. Everyone is showering flowers on them. 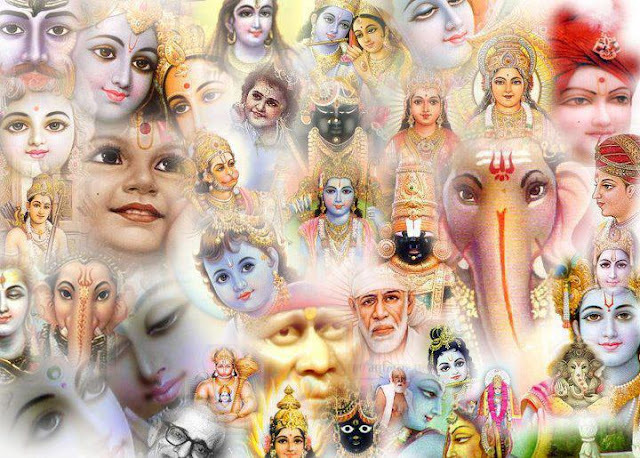 Brihaspati, Vishnuji, Brhmaji, Sarasvatiji, Lakshmiji, Shukracharya, the saptarishis, Devatas, all are happy. Parvati puts Jaymala around Shivji’s neck. Ganas are dancing. Ganga gives a garland to Shivji, which he puts around Paravti’s neck among the chants of Har Har Mahadev. Tears of happiness are rolling out of Mena’s eyes. She says she is fortunate to welcome Shivji. They enter inside the palace among chants of HarHhar Mahadev. Inside the palace, Himavan washes Shivji’s feet with water, milk. Everyone is admiring this sight. Rishi Garag tell Himavan to wash Barati’s feet. 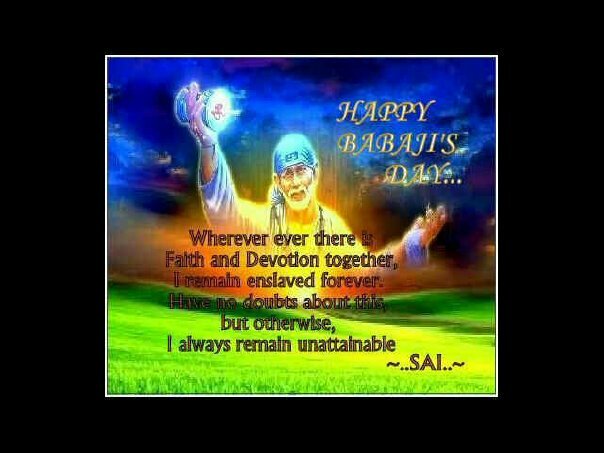 He does so for the Saptarishis,Brihaspati, Shukracharya, Naradji. They bless him. He washes feet of the Ganas too who hesitates but lets him do so. Shivji & parvati are watching this happily. Rishi Garas tells Himavan to start Vadhu satkar. Nani says that’s groom’s father’s responsibality. Everyone is trying to find the answer. 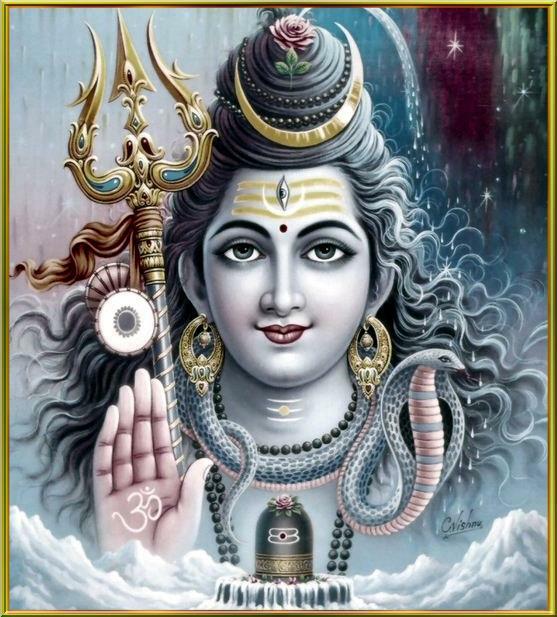 Shivji says when Mata Anasuya had compeleted all the duties of a mother then father’s duty should be compeleted by rishi Atri. Hearing this rishi Atri is owewhelmed says, I am a normal human, you have proved today how much you care for your devotees. You have made me the most fortunate today. Rishi Atri compeletes the vidhi of Vadhu-satkar by giving fruits etc to Parvati. Next Rishi Garg says now other vidhis will be after bhojan. Nani invites everyone for bhojan. In a Telepathic convo between Shivji & Parvati, he asks her to look at him. Next there is a curtain between them. One side Var-paksh with Shivji & the other side Vadhu-paksh with Paravti. Both are sitting for bhojan. Now Parvati feeling shy lifts her eyes, looks at Shivji, who is eagerly waiting for her to see him. Precap: Shivji starts eating, he finishes all the cooked food made for everyone. Himavan is surprised, others are surprised & worried too, they don’t know what to do. Parvati is thinking, Shivji gives her a mischivious smile. Every human being is gifted with a talent, which is latent in him. The talent, merit and ability are all but the divine gifts. God appreciates if we make a good and effective use of the talents He gifted us with. The more we make a greater use of our talents, the more our ability and efficiency would increase. Hence, we should not hesitate to put our efforts, befitting our abilities. Just as a bumper harvest is reaped by sowing seeds and cultivating with care, so also we are assured of God's blessings when we repose faith in Him and render selfless service to the society by the talents He gifted us. Depending on individual talents, each person will have a different set of skills. A singer, by singing hymns in praise of the glories of God, can inculcate devotion in the hearts of people. Another one could beautifully describe God, His divine works in a fascinating manner and can create picture of God in the eye of public mind. 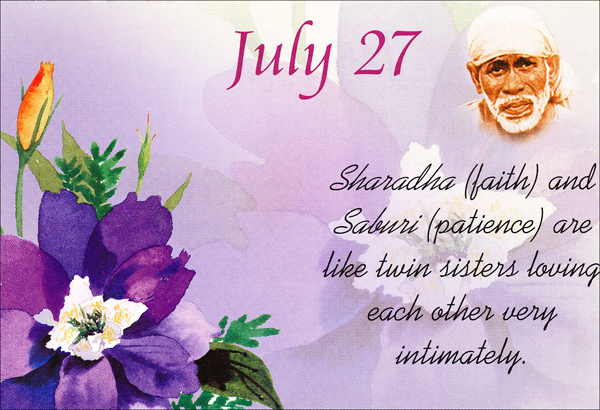 Thus, if we make proper use of our talents, the Omnipresent Sai will richly reward us with His Grace. 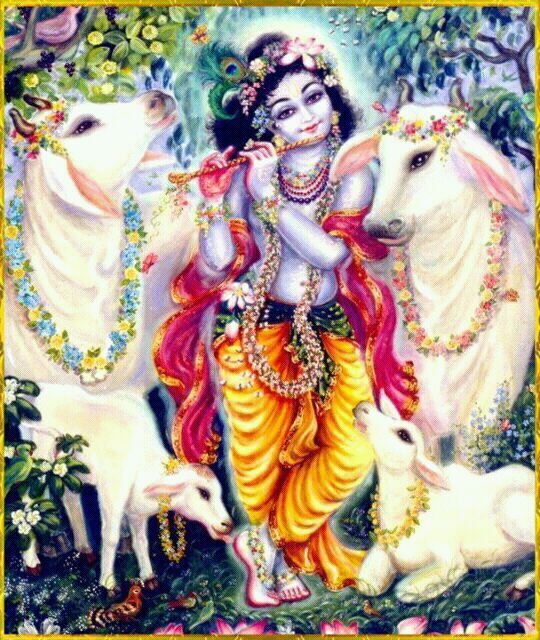 The Creator will be highly pleased if we devotionally offer a garland of flowers as service to Him from the very flowers He has created. 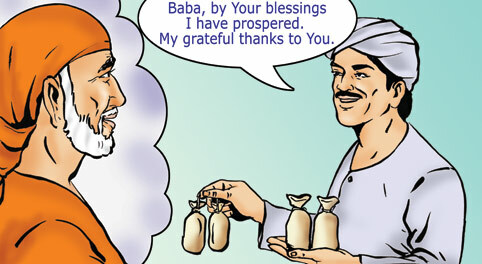 If we put our Baba-blessed talents in serving and making people happier, Baba would be immensely pleased. We, therefore, shall become pure souls worthy of dwelling in Him.